This painting is based on a work by the Dutch artist Govert Flinck (1615-1660), a student of Rembrandt. Indeed, many of Flinck's paintings have been wrongly attributed to his famous tutor. This confusion of styles and attributions is rather entertaining. In my work, I have retained much of Flinck's composition, but have painted his skin a horrible radioactive yellow while his eyes have become cloudy, suggestive of cataracts. But perhaps most importantly, the viewer can look at the figure - but he is prevented from gazing back at you. 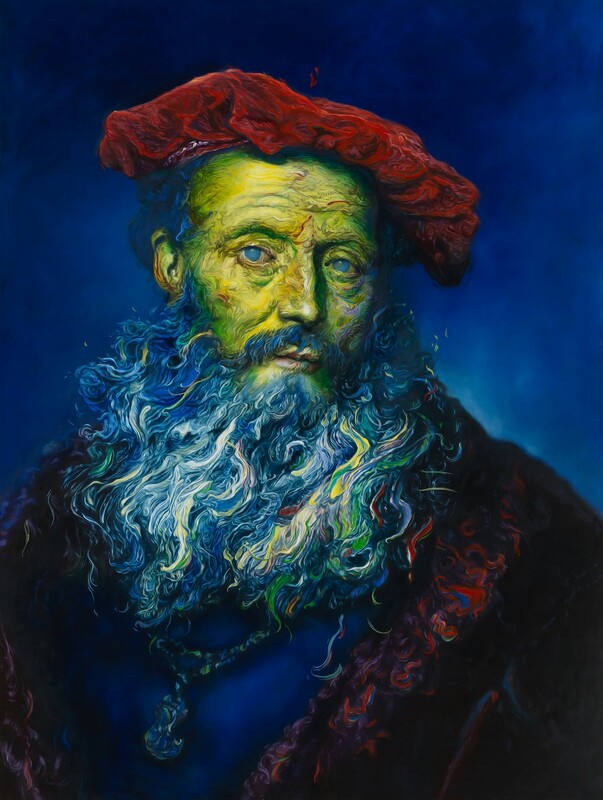 The lines and colours of brushstrokes which make up the beard give the painting a disturbing feel, as if this wild, untamed beard has a life of its own.